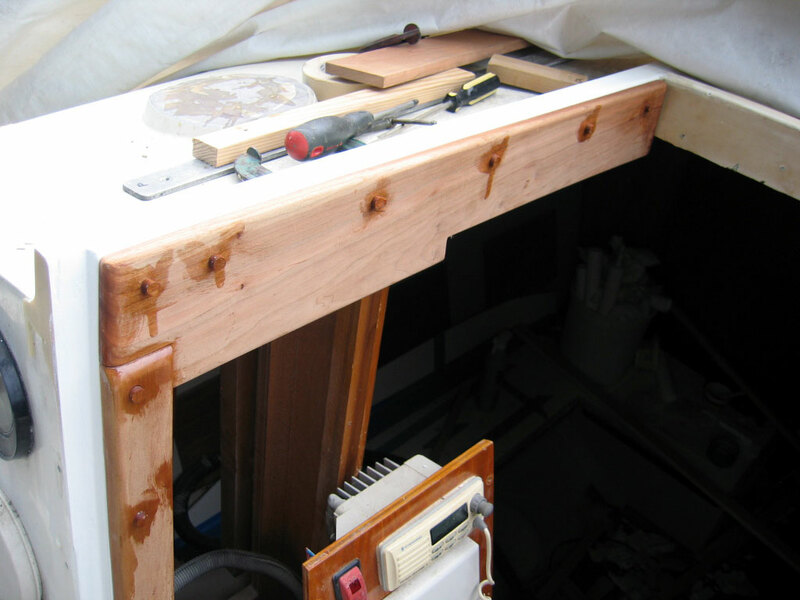 This page covers various woodworking on the boat that doesn't seem to fit into other project areas. 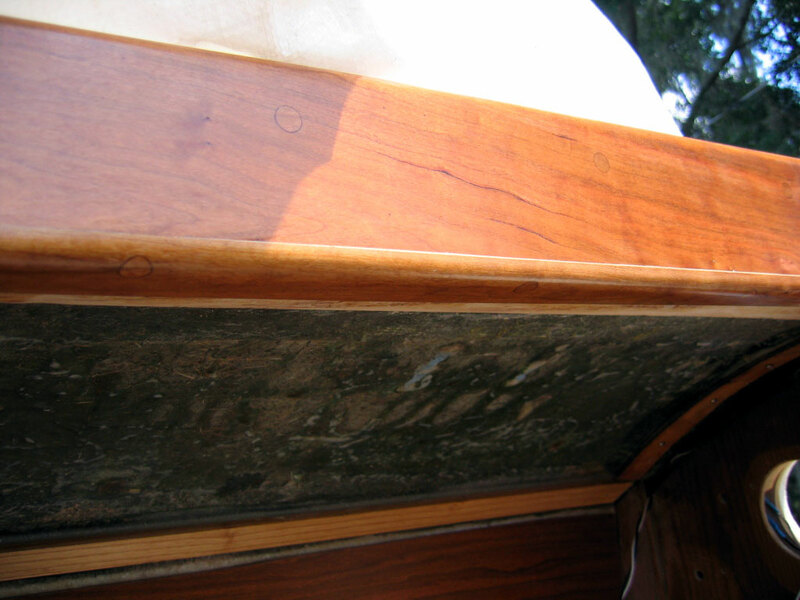 Originally the companionway was dressed in mahogany from the Bristol yard. I replaced it about 15 years with white oak. 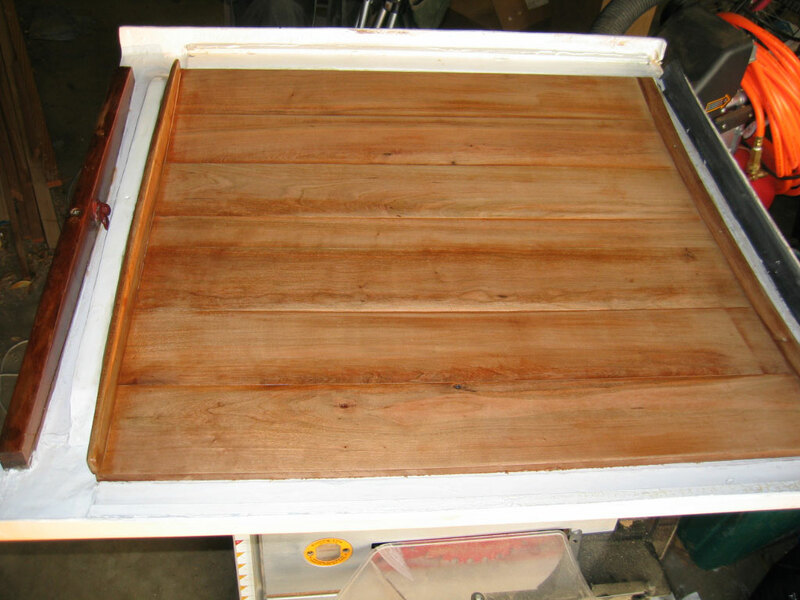 At that same time I replaced the original mahogany plywood drop boards with teak drop boards. 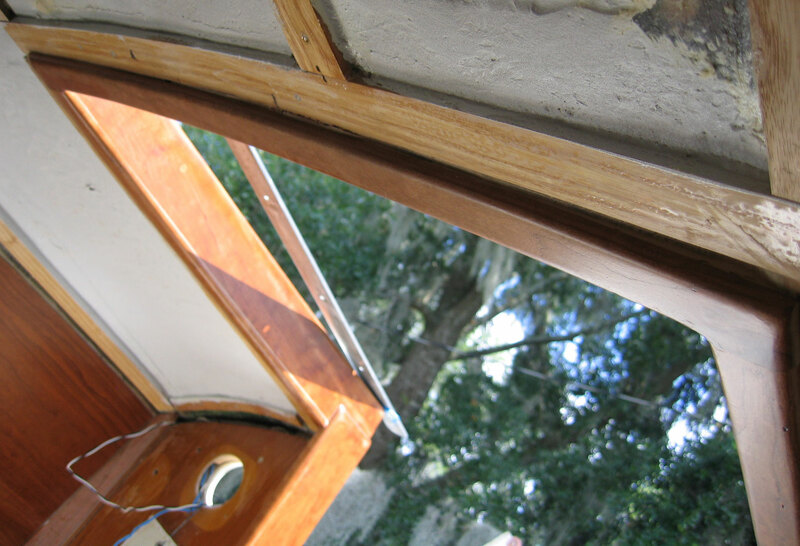 As a part of this refit, I was forced to tear out all the white oak dressing to get at the remains of the cabin overhead lining I removed. 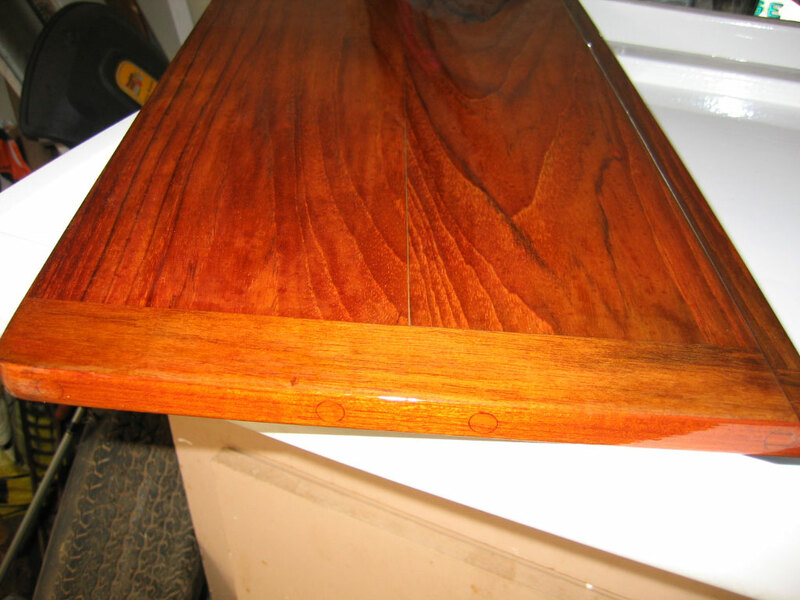 So I refaced the companionway in cherry, I added a cherry ceiling to the companionway hatch, and refinished the teak drop boards. 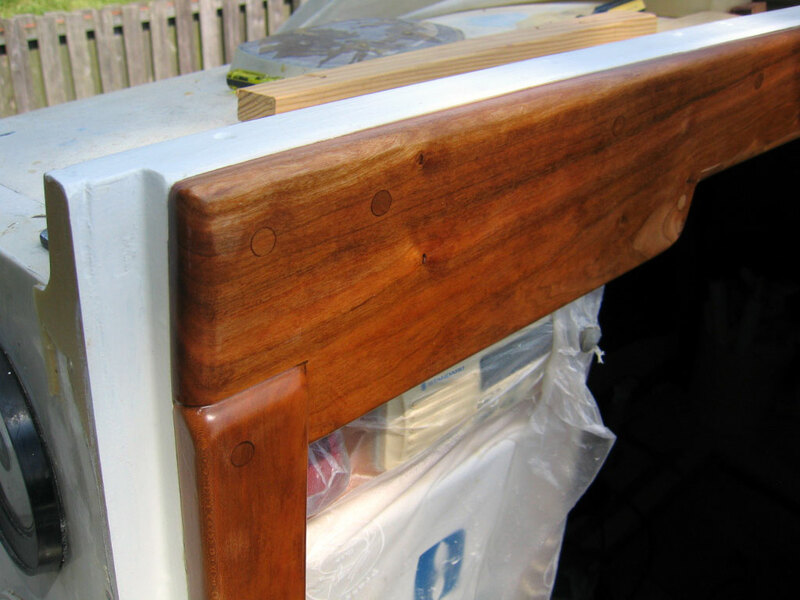 All the wood surfaces, since they are all out in the weather, are encapsulated in epoxy and finished in System Three water-based LPU clear satin (except for the drop boards which are finished in clear gloss). The drop boards planks are glued and biscuited together, with vertical edge trim to prevent the boards from warping and give the joints more strength. 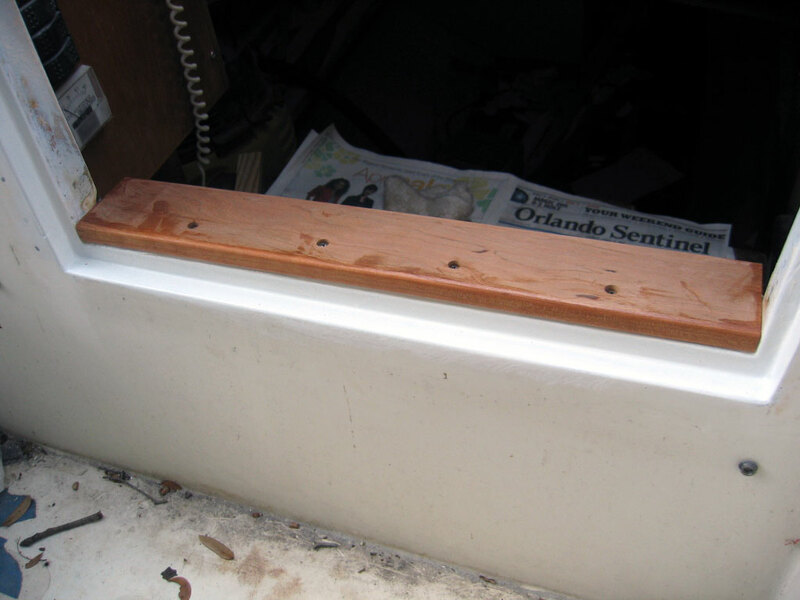 The middle board has a Lexan port installed. They are probably the same strength as the original plywood, which I carry as a spare set, but considerably better looking and more shipy. 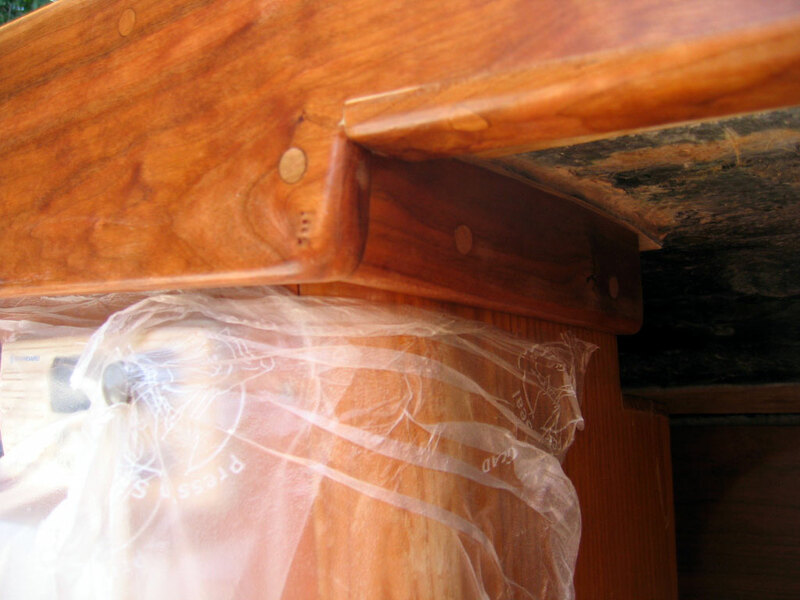 The cherry dressing for the companionway is glued and screwed in thickened epoxy. 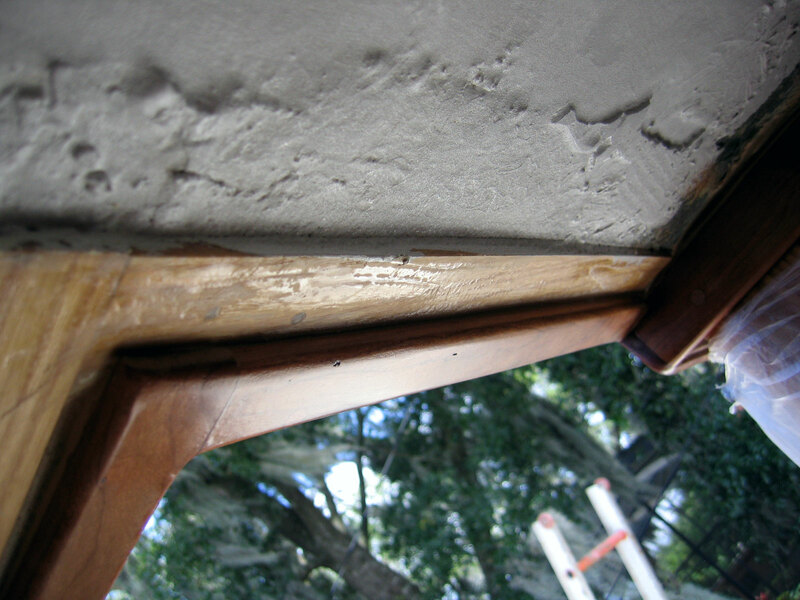 The edges of the opening are not particularly straight and require at least a lot of caulking. 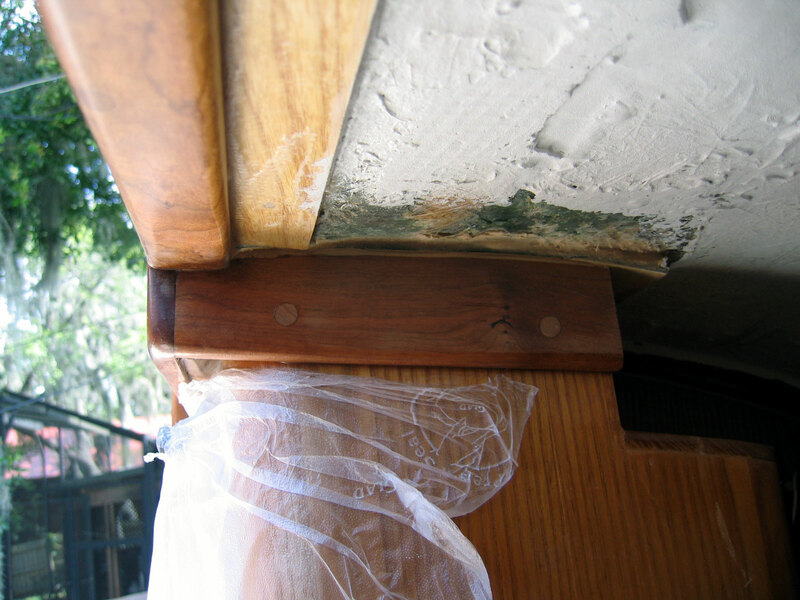 Gluing will add tremendous strength to the opening, which I consider too large for offshore work, .but I'm not willing to modify it yet. On the left are the vertical side pieces for the opening. 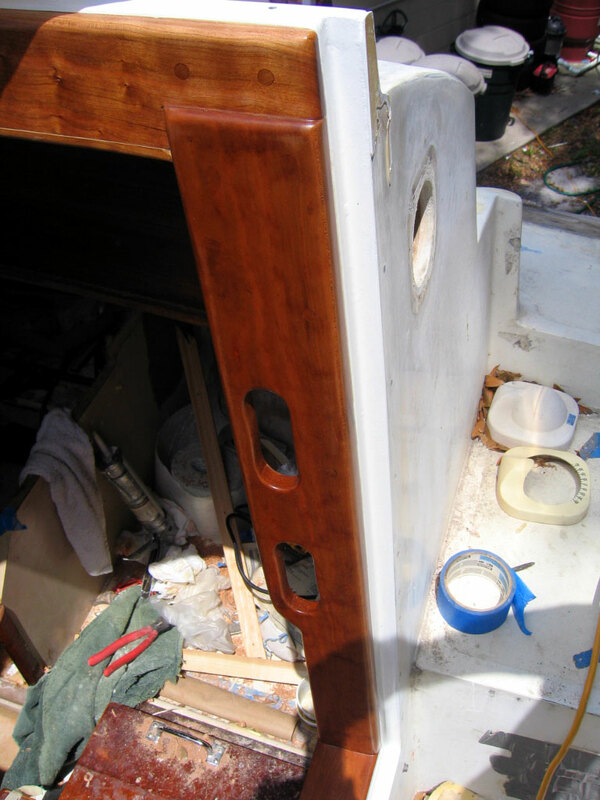 On the right is the threshold: 1" cherry, as hard and stubborn as iron As you can see in the pictures I incorporated a handhold into the starboard companionway facing. 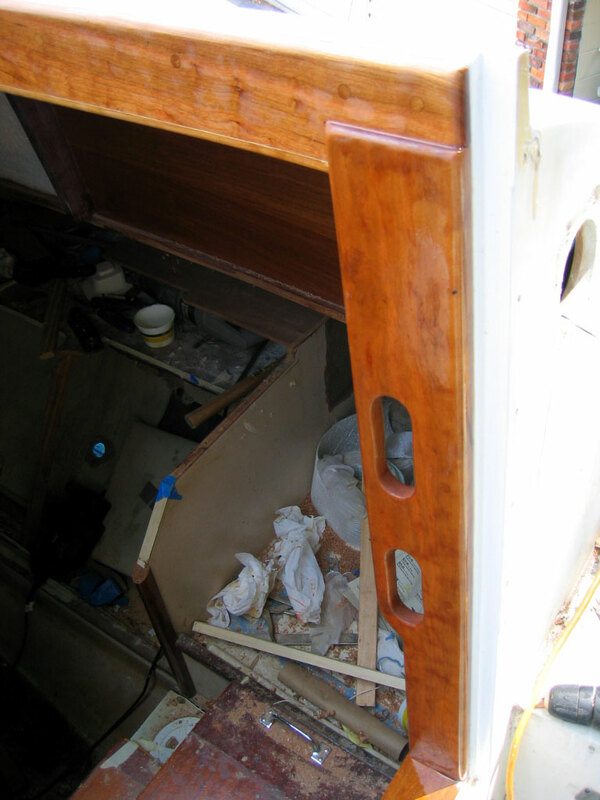 Below is the port side trim. 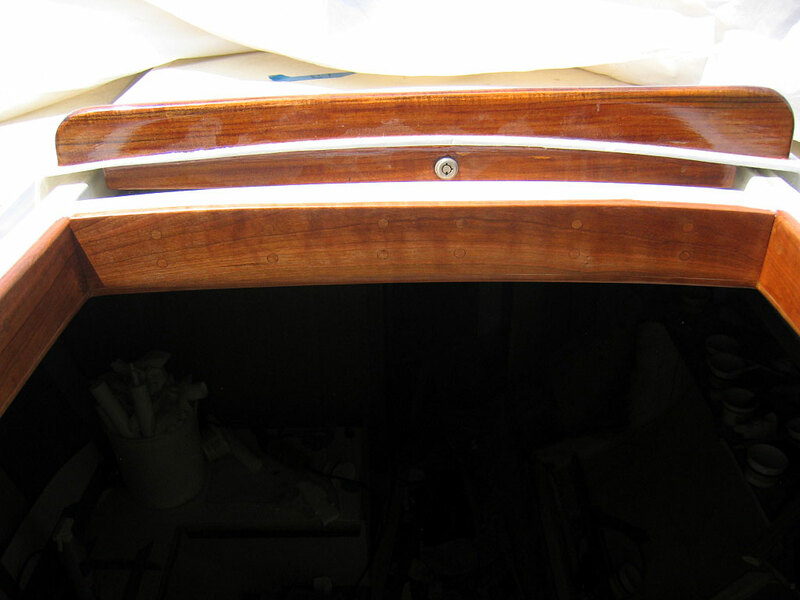 Below are the two vertical sides and the forward edge of the companionway surround. 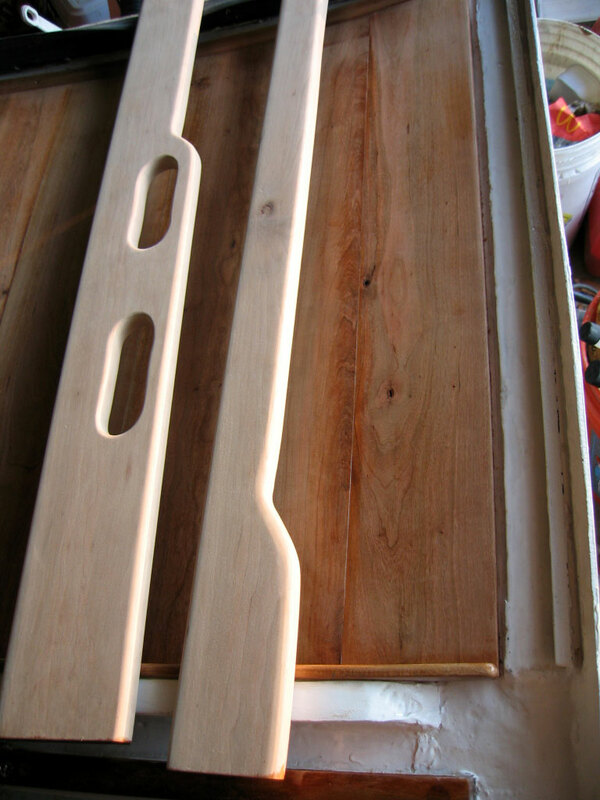 Below, you see the interior trim pieces to finish out the surround. 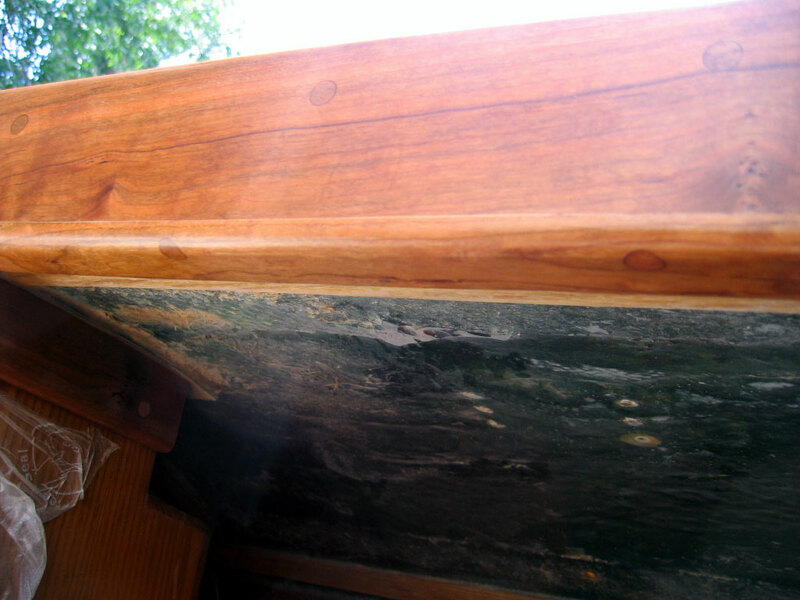 The inside of the Bristol's companion sliding hatch was never a pretty sight. 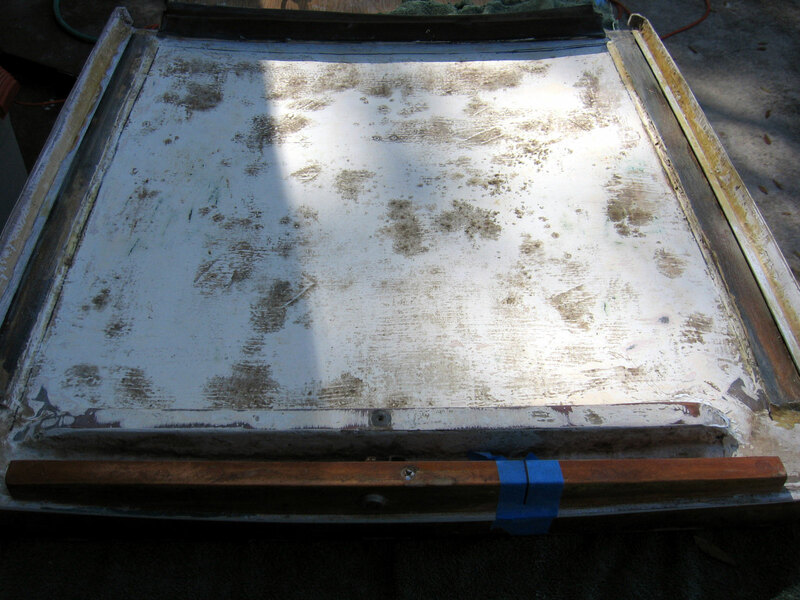 It is rough fiberglass and even sanded and painted tends to collect mold and mildew. So for this refit I decided to dress it in cherry. 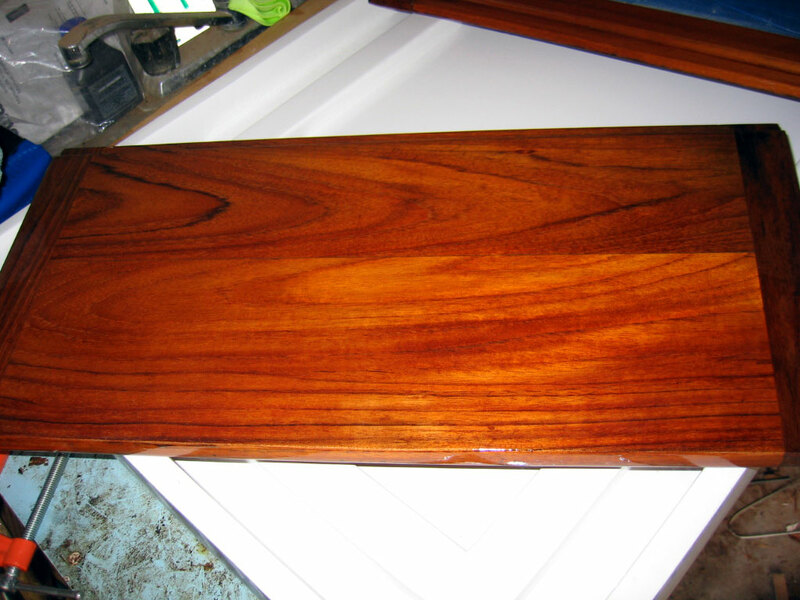 The planks are the same as what I am using for the vertical surfaces in the cabin: 4 inches wide by 3/8's inch thick. 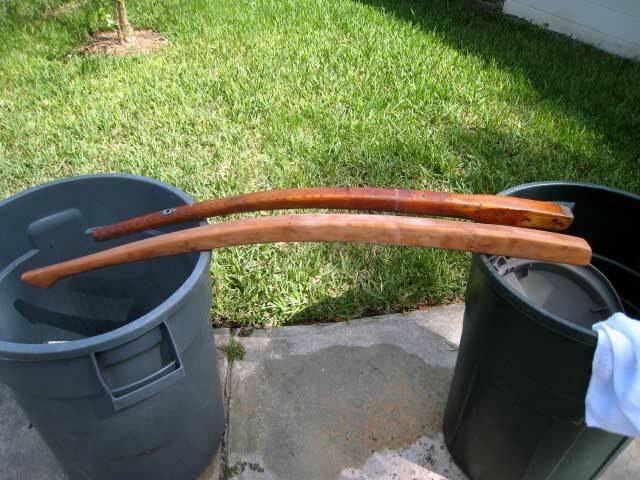 The are laid fore and aft in thickened epoxy. 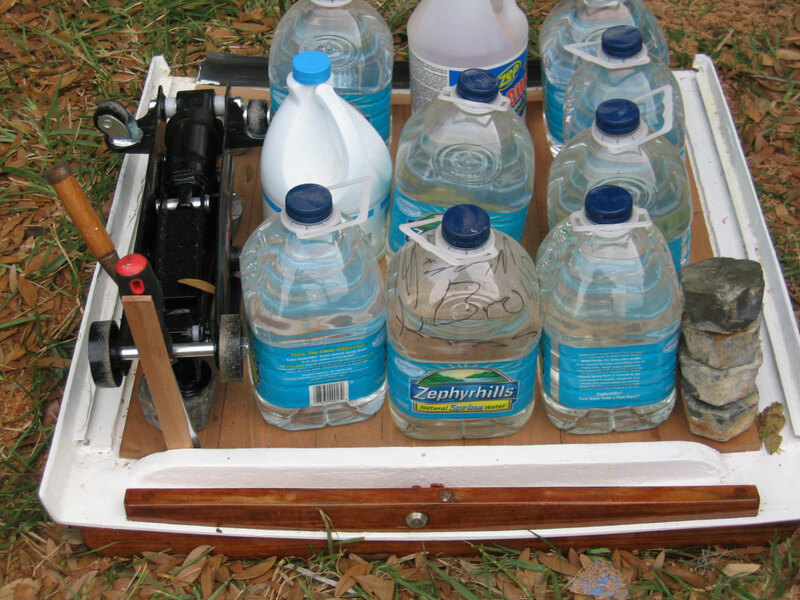 You can see in the picture I used water jugs and even an old car jack to add enough weight to hold the planks in place till the epoxy kicked. I dressed up the visible edges and finished it in clear satin LPU. Here is a teak dorade box I am building for the weather deck. Here are new dorades for the cabin top. 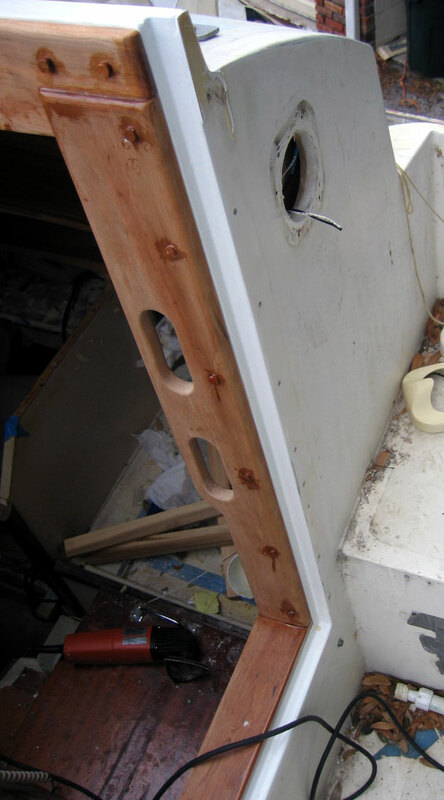 Here I detail building an integrated dodger coaming out of wood. 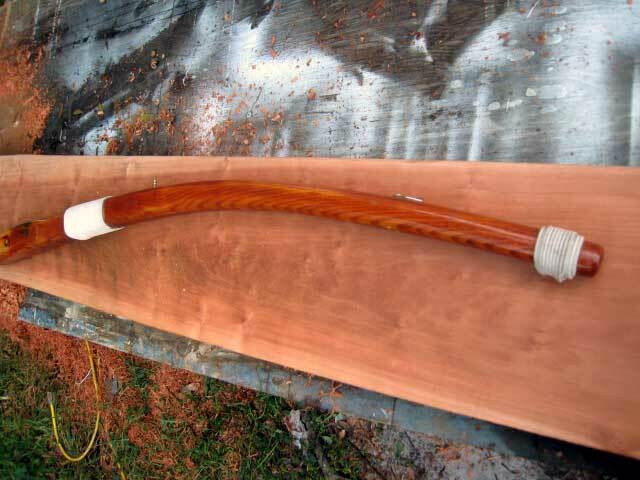 Here is a seahood I built. 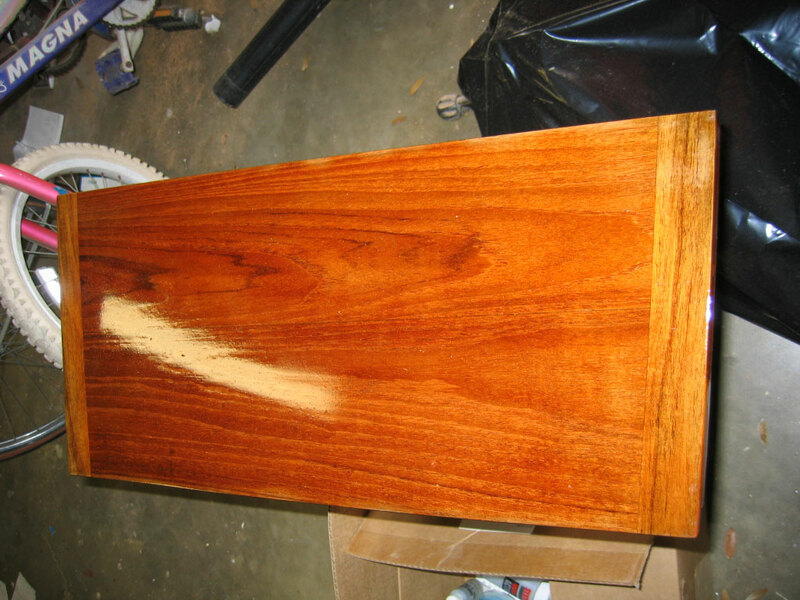 Here is a description of new teak coamings and covering boards installed in the cockpit. Here is the finished tiller mounted in the Shaefer tiller head. 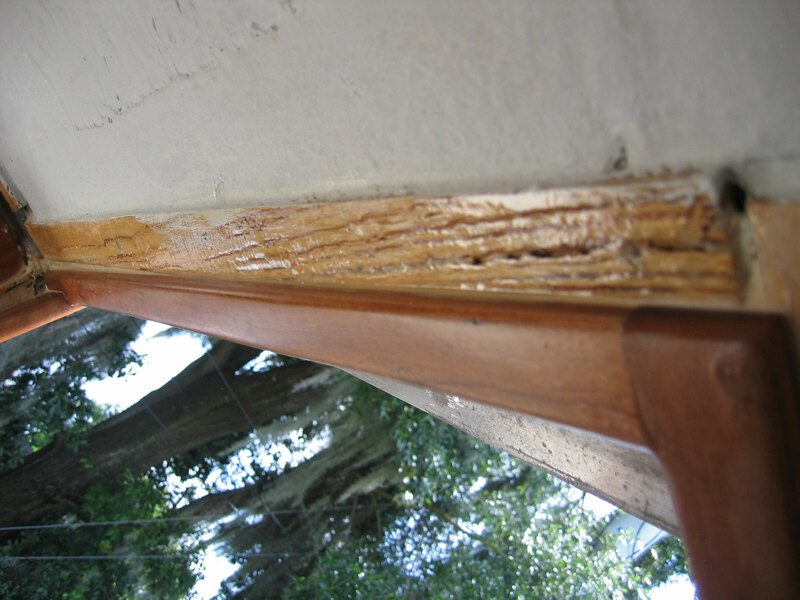 The tiller has 4 coats of epoxy and 3 coats of System Three LPU gloss. The mounting hardware is all 316 stainless from McMaster Carr. 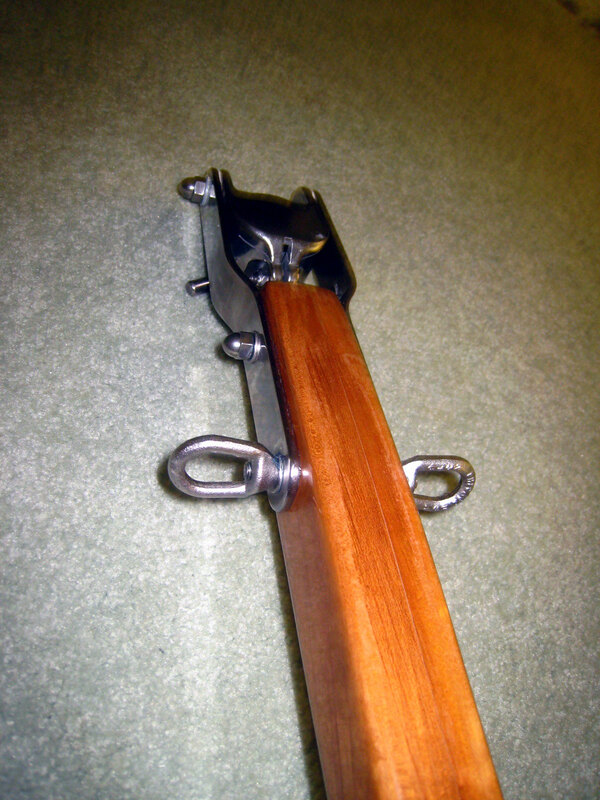 This is some detail of the tiller head showing the eye nuts I mounted to accept rudder stops (short lines that run from the tiller to the cockpits sides to limit hard over rudder travel during storm conditions).